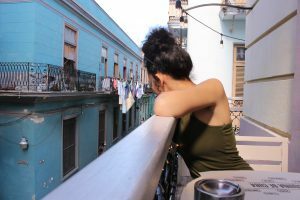 This was the second Saturday of our stay in Havana. This meant that we had become familiar with places around the city that we enjoyed spending time at, and we started to develop habits around the types of things we would do during our free time. 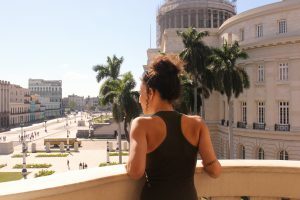 This day began with a field trip to the opera house in Old Havana. Many of the buildings we had seen and toured by this point were elegant, but somewhat run down and neglected. Walking into the opera house amazed all of us at first sight. The main stairway was stunning and well kept. 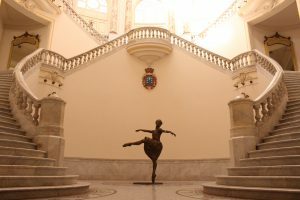 The grand foyer had photos of the ballet dancers displayed around for viewers to gaze at. 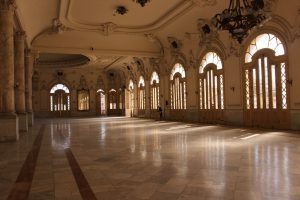 It was interesting how much the Cuban government and people valued these forms of art which were evident by the amount of work and money invested into maintaining the building and developing the performances. 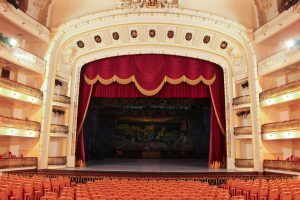 Because several of us were so impressed by the impression we were given of the performers and space, we decided to buy tickets to see Swan Lake another night. 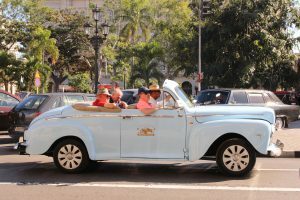 After our tour of the opera house, we were allotted several hours of independent exploration time to explore Old Havana. 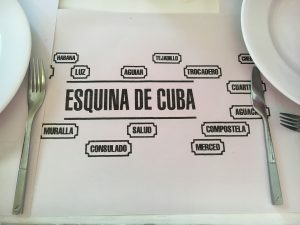 My roommate Denia and I decided that we wanted to go back to a lunch spot that we were introduced to on one of the first group lunches in the city. The restaurant was a paladar, a privately owned and operated restaurant. 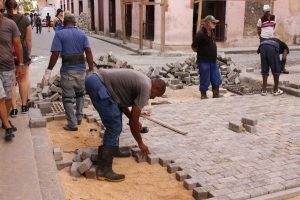 One of increasingly many permitted by the Cuban government. 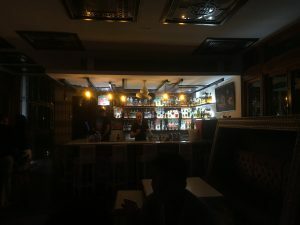 It was a small place that looked old and rustic on the outside, but modern and trendy on the inside. It was located on the second floor and had a balcony where Denia and I sat. 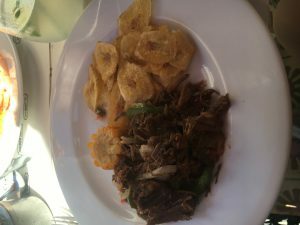 She ordered shrimp, and I ordered Ropa Vieja. Our meals came with rice, beans, and a salad. We really enjoyed the food and the atmosphere of the place. We could see all on the busy side street below us, and we even engaged in a conversation with some waiters at the street corner trying to catch wandering tourists to point them in the direction of their restaurant. After our meal, we spent the rest of our free time roaming new streets in Old Havana, trying to see if there were more shops full of artwork that he hadn’t seen before. We had just spent time in a familiar place and we wanted to see more of what the city had to offer, so we hit the streets with open eyes. 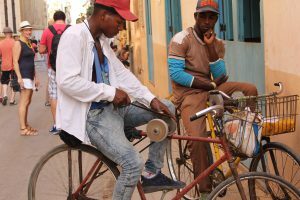 Along the way, we saw some people working on putting stones in the streets and even a man sharpening a knife using a bike. When it was time to meet up with the group again, we started walking towards the waterfront to meet at the Rom Museum. The tour at the museum was quite interesting. Among the many things we learned, we learned that sugar cane came from Asia, not the Caribbean, but because the climate conditions were so good, the sugar cane industry exploded in Cuba. We also learned about the old and new techniques for making rum. This was also a very modern place, that looked rustic on the inside, but very well kept on the inside. 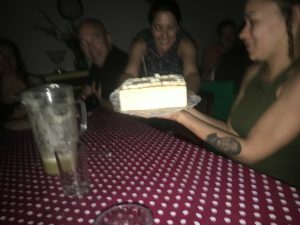 This day also happened to be Denia’s birthday, so at dinner back at the Residencia, she was surprised with a cake that our API coordinator bought for her. This was a great moment and we all really felt like a family coming together over the past week. 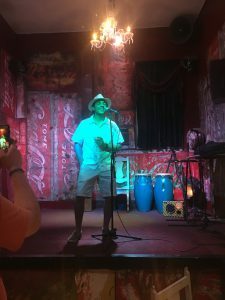 Later that night, our professor wanted to take us through a long walk in Central Havana to a famous rooftop restaurant that he had fallen in love with because of the views of the city. It had been featured in the film Strawberry & Chocolate, the only Cuban movie to ever be nominated for Best Foreign Film at the Academy Awards. 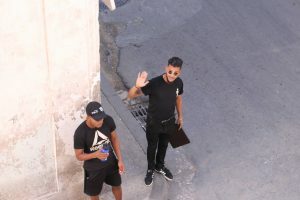 It was not only a new and enjoyable experience to be in the atmosphere of the rooftop, but it was also a fun journey to walk there in the heat of the night. We saw a lot of local people playing music and dancing and singing half in their doorsteps and half in the street. We saw many men sitting around a folding table under a streetlamp playing dominos. 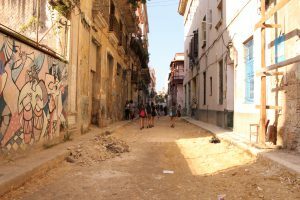 It was cool to witness what life on a normal neighborhood street feels life vs. one that is catered towards and inviting to tourists, like those in Old Havana. After we spent some time at the rooftop, our professor took us to another place not too far down the street where Andrew went up on a stage and told some jokes while the rest of us chatted and played card games to enjoy the night the time we had together. This day was full of breaking from the patterns and exploring the unfamiliar. Each time we found something new, we were pleasantly surprised and impressed by what we found. The places that we discovered that day ended up being places that we wanted to return to later. On other days we went back to the waterfront to take the ferry across the water, and we went back to the rooftop to see the view in the daylight and sunset, for the spectacular colors on the buildings.